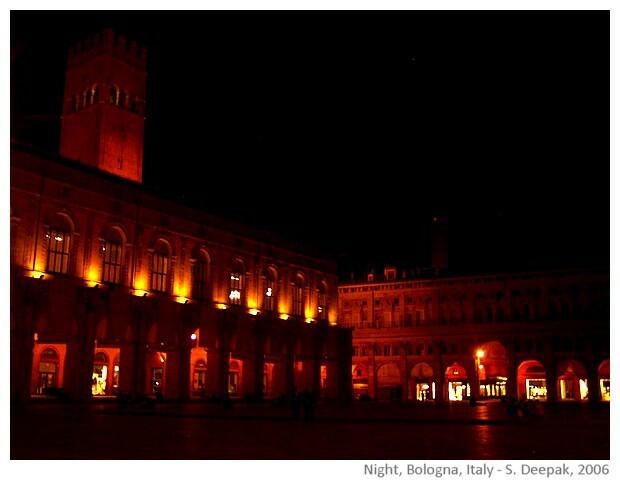 I love this city, Bologna, where I live. Lot of persons from India pronounce it in an incorrect way, like in a story of Gulzaar I had read in the Hindi magazine Hans a couple of years ago. But actually, it is pronounced Bolonia because in Italian, the 'gn' together produce a liquid sound of 'ni'. When friends and relatives come to visit us, I often take them around the city, explaining the history, architecture and the art. However, most of the time, I know that our guests are very easily bored. I guess that coming from India, for us "tourist place" is meant to be something imposing, huge thing otherwise, it leaves us indifferent. When I go out, the colours of buildings, the shapes of spaces, small details of understanding how people lived two hundred or five hundred years ago, fascinate me, but they bore most of our guests. "Yeah...", they say, scratching their heads, trying not to hurt my feelings, trying to hide their boredom, showing more interest in front of electronic shops or Armani boutiques. Where I can buy nice Italian shoes, they ask, not even looking up at the wonderful lattice carving from fourteenth century in the Piazza della Mercanzia. They complain about the cobbles in the medieval streets, ignoring the harmonious beauty of the church's façade. "What is there to look inside a church? ", they seem to ask me silently as I take them around inside a church, unable to see anything worthy of their attention in the paintings or the architecture. I would like to go to Pisa or Venice they say. Of course, Pisa and Venice are more touristy, they have things to show that are more imposing, huge, monumental. And, I also like going there. But I also love Bologna, and its more delicate, less in-your-face beauty, and it is full of small things laced with history hidden at every corner. Like the terracotta statues in the church on Via Clavature right in front of the main city square, Piazza Maggiore. They are in the "Santa Maria della Vita" church. I had walked around that church at least hundred times, never knowing that theose sculptures existed, till suddenly yesterday I had gone there. Actually, I had gone inside the church to take a picture of the statue of St. Teresa d'Avila, a saint whose prayers I like very much. Her poetry reminds me of the bhakti songs of Mira, simple and poignant. A woman cleaning a candle stand had seen me, standing there, perhaps looking a bit uncertain. Actually I was wondering if I could use a flash without disturbing the persons praying there. She had pointed towards the alter, "There, behind the stairs are the statues", she had told me. Which statues, I had wondered but then curious, I had gone in the direction she had indicated. There, behind the stairs in an alcove, hidden in the shadows was a group of most wonderful terracotta statues I had ever seen. "Crying for Jesus" is the name of this group of statues made by Nicola dell'Arca in 1463. They were kept hidden for a long time since people felt that some statues were too vulgar as they showed shapes of breasts with clothes clinging to the bodies in an "improper" way! The two Marys in the right corner with their mouths open in a never ending scream, their bodies contorted in desperation, are the ones I like most. They remind me of the more famous Scream by Edvard Munch that was stolen from Oslo two years ago. To be honest, when I had seen that painting, I had not been particularly impressed by it. If you are in Bologna, go to the Santa Maria della Vita church and take a look at the two Marys, and then tell me if you don't think they are wonderful! 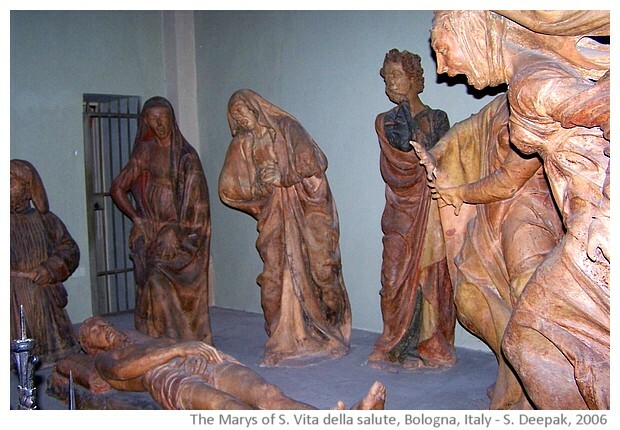 The two crying Marys also explain a common saying in Bologna. When they say, "She is like one of the Marias", they mean to say that she is very ugly. Actually, I think that the two Marias are beautiful, but then beauty is subjective! 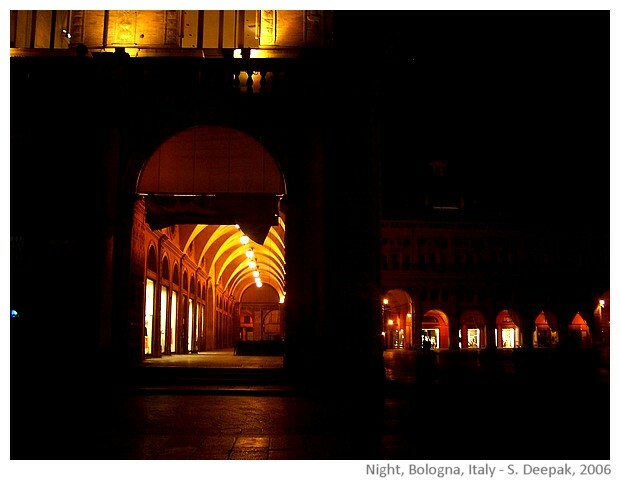 Bologna by night is even more beautiful than by day. Perhaps, that is not very accurate. There are parts of Piazza Maggiore, that I absolutely love in the light from setting sun, but in the night the city acquires shadows that soften the rough edges, hiding forbidden pleasures in the dark corners. Like the view of Piazza Maggiore from Via Clavature. I love the small pieces of sky peeping in from beneath the arches. Bologna is full of archways. On a rainy day, very convenient. Or like the small old street with restaurants next to the medieval art museum. 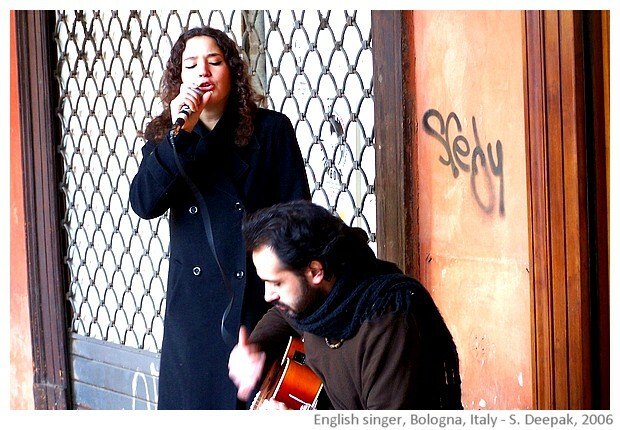 Yesterday there was this couple singing under one of the archways. They must have been British or Irish. The girl had a wonderful voice, touching the high notes effortlessly, while the wonderful acoustics from the archway echoed her voice, making it seem even better. They received lot of coins from the passersby and their bag was full. After the musical couple, it was the turn of the juggler in the main square. 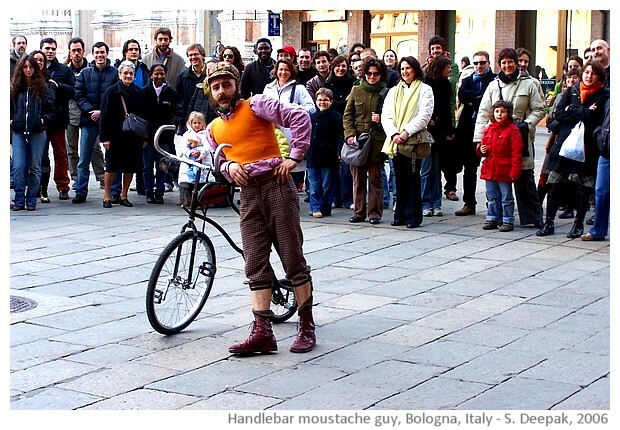 With a big handlebar moustache, he seemed to be from another time. And, he was wonderfully clumsy with the flying dumbells. I don't know if it was intentional but when he missed to catch one in time, everyone roared with laughter. Then he took out a funny bicycle. As soon he saw me clicking his pictures, he posed for me a few times and then, showing me his tongue, went on in his clumsy way on the bicycle, falling down soon after, provoking another roar of approval from the crowd. It is election time in Italy. Voting will be on 9 April. Mr. Berlusconi, the present prime minister is everywhere, with new hair transplant, rosy cheeks and fake smile chosen by his spin doctors as the most authentic ones to vow the voters. He uses the Government machinery for making publicity about all the good things his Government has done. In the last one week, three letters have arrived at our home from him and other ministers, reminding us of the good things they have done. Your life has improved, he tells us. Sure, we are stupid and can't make it out ourselves, that we much better off. "Do you want more taxes? No thanks. Do you want more illegal immigrants? No thanks." These are the main messages of his campaign. And, in the mean time he merrily makes new laws to safeguard and strengthen his personal empire worth in millions. "We are already rich, so elect us, we will steal less!" that is a common message that people give in different countries and voters are easily taken in. Politicians are thieves is a common perception so one hopes that the rich ones will be smaller thieves! Anyway, I don't like Mr. Berlusconi. But he has huge fan following. People seem to lap his words as the truth and the only truth. I hope he won't win. I had also hoped that Bush won't win. And, Blair too. But, it seems voters any where, don't share my concerns. Perhaps I bring good luck to people, I don't like? 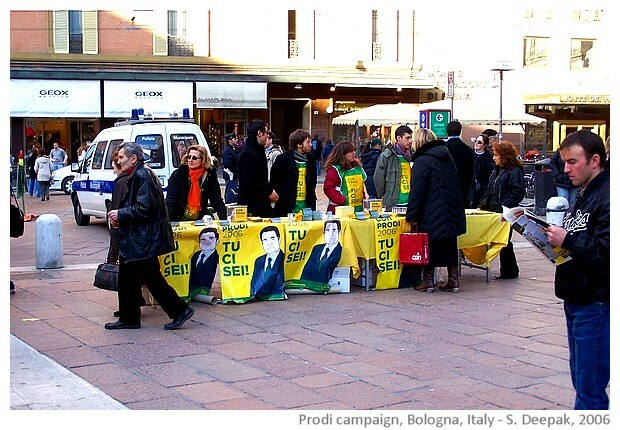 Mr. Romano Prodi, is the main candidate opposing Berlusconi. The professor, as he is commonly called, is from Bologna, is ex-president of European Commission. His campaign style is more people friendly but he is serious and boring. To listen to him speak, I tend to sleep off. I like to listen to some other Italian politicians like Bertinotti (head of far left party) and Fini (head of far right party), even if I don't like their policies one bit. But they speak very well. Yes, I know, it is confusing, the people I like, they put me off to sleep and those, I don't like, I like listening to them! So who do you think I am going to vote for?